Sure, it's only a preseason game, but Wednesday night was a quick glimpse into the tempo and atmosphere of what facing the Calgary Flames, Version 3.Keenan-0, will really feel like. Since we gentle Canuck fans know pretty much what Keenan is like, it wasn't a terrible shock at all to see the fists fly and stick chops all night long. Poor Alex Burrows had to contend with Eric Godard, who's three inches and 30 lbs his superior, a mere 201 seconds into the first. Other Calgary players - Conroy, Phaneuf and Hale - all made their presence felt rather bluntly throughout the game. The damndest thing though: the scoreboard was showing a 1-0, 2-0, 3-0 and finally a 4-0 score all in favor of the Canucks. 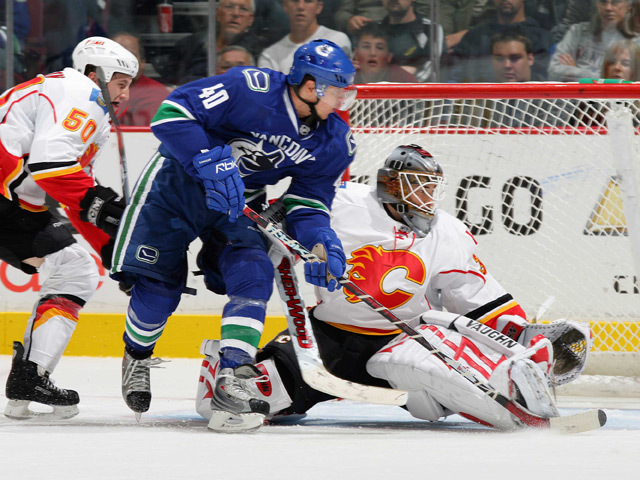 Alexander Edler opened the floodgates against Calgary pipelord Miikka Kiprusoff and, after Kipper was pulled, Jason Jaffray, Michael Grabner and Ryan Shannon took their turns abusing back-up Curtis McElhinney (someone call security, I doubt that's a real name). The Flames, for all of their obvious complexes, just couldn't solve Roberto Luongo or Corey Schneider all evening long. Sure, it may mean nothing, but tell that to Luongo when he stonewalls a team with his arch nemesis chewing ice and barking orders behind it. And I won't even bring up that Schneider held the down shutout fort in his first sniff of NHL-caliber action because, well, that would be just silly. And how do you follow up that game? By taking on a team with even more of a complex: the Oilers. In between about a zillion hooking, fighting and holding calls, there was actually a game in there as both squads showed off their new digs in a see-saw match. Ryan Kesler and camp standout Mason Raymond showed some flashes of brilliance, Shaun Heshka picked up two assists and Shannon once again played strong. The very green defensive core limited Edmonton to a meager 10 shots. True, MacTavish got to unleash his prized off-season acquisitions - Penner and Souray - but lost in that was that Vigneault got to unleash his: Brad Isbister (also known as 'The Taylor Pyatt project 2.0'). Isbister played a strong game, but waited until the final three seconds to finish off a 2-on-1 (hmm, wasn't that Souray on the ice at the end there?) to dust off his old team. I know I know, it all means nothing. It's just preseason, see what happens in two weeks, the rosters aren’t even set yet blah blah blah. The devil's in the details sometimes and the devil here is that the Canucks withstood two straight games from nasty rivals and won them with strong efforts from the kids and veterans. You can't but help get that sneaking suspicion that this team is ready to go out and defend their divisional title and then some. * A million apologies to those who caught the Motley Crue reference for the title of this post. I, too, am disappointed with myself and am walking into traffic right now. Wow you have a good writing style that makes these blogs interesting, keep up the good work! Hey Mike, are you blogging here permanently now or what? wow....dats awesome.....I LOVE DA CANUCKS!!!! !THEY'RE MY LIFE,THEY'RE MY HEART,THEY'RE MY SOUL!!!!! 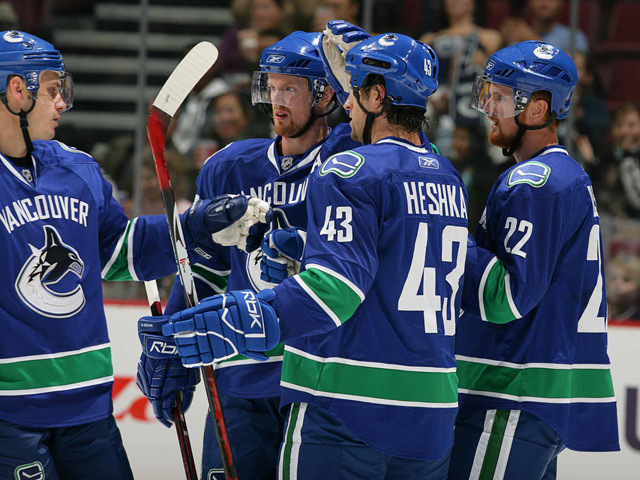 :D they always cheer me up,they make me really happy when i grow up,i wanna be the owner/gm/biggest fan/bestfriend of da CANUCKS!!!! "No matter what happens,you will always be bieksalent to me!!!!"